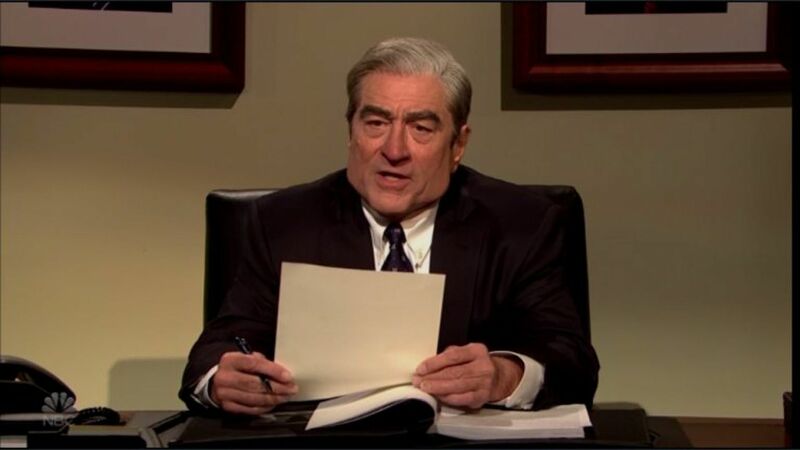 Robert De Niro reprised his role as Special Counsel Robert Mueller as "Saturday Night Live" dedicated the opening sketch of its return show to the fallout from the Mueller report's conclusion. Details: De Niro's Mueller read from his report that his team had not drawn a definitive conclusion on the charge of obstruction of justice. Aidy Bryant's William Barr responded, "But I have, and my conclusion is Trump clean as a whistle." Alec Baldwin's Trump exclaimed: "Free at last, free at last!" The sketch ended on a somewhat ominous note, with De Niro's Mueller referring to a New York investigation. "P.S. can’t wait to see what the Southern District of New York has in store for Trump," De Niro said.